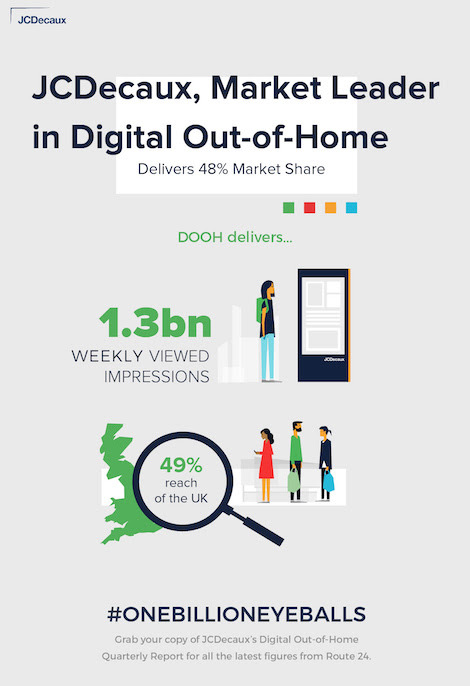 The Digital Out-of-Home (DOOH) advertising market now delivers over 1.3 billion weekly viewed impressions, with JCDecaux contributing 637 million, according to the latest data release from OOH industry audience currency, Route. Digital is revolutionising the industry, providing limitless creative scope for targeting audiences with DOOH’s dynamic, innovative and interactive solutions. This growth in digital is largely facilitated by the high simplicity, high impact format of portrait screens (9×16 and 2×3), which allows creative copy to transition between mobile and DOOH seamlessly. Portrait format currently delivers a total of 80% of weekly viewed digital impressions. As part of its mission to reach #onebillioneyeballs per week, JCDecaux has made a number of significant additions to its digital portrait screens in key locations, including the launch of the National Towers Channel as well as digital upgrades to the London Waterloo Gateline Channel. Overall, JCDecaux continues to lead in DOOH with nearly half (48%) of the market share. The Route 24 (R24) data reveals JCDecaux has increased 6% in viewed digital impressions, with a 15% increase in Roadside viewed digital impressions and 10% increase in Shopping Malls’ viewed digital impressions, since the last Route release in June. Impressions are based on natural delivery which is calculated by totalling the audience delivery of each individual spot. This entry was posted on Thursday, September 14th, 2017 at 14:17 @637 and is filed under DailyDOOH Update. You can follow any responses to this entry through the RSS 2.0 feed. You can leave a response, or trackback from your own site.